Have you catch the latest blockbuster Wonder Woman that was on screen earlier in June 2017? We have not but will do so soon, I haven't read any critics about the movie yet but I am sure it will be good. This seems to be one of the Must Watch movie of the year, its no wonder because it's a movie about a female superhero! Yes! Too many male superhero movies for the past years! Inspired by this powerful Amazon warrior, DC Comics Super Heroes Cafe came out with a menu that represent empowerment and strength. You will be pleased to know that organic ingredients for the Wonder Woman dishes has been carefully selected to represent the nature of Wonder Woman's homeland of Themyscira, the lush island nation. Let's get started with the limited-time only Wonder Woman menu. The Themyscira : My Salad Origin is refreshing, crunchy and nutritious salda that consists of purple cabbage, green papaya, bab red radish, sliced carrots and cherry tomato. 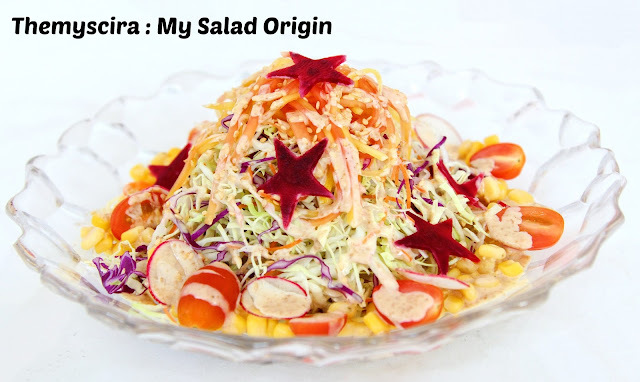 This colorful and vibrant dish is topped with creamy sesame dressing, sesame seed and sweet corn, decoratted with start-shaped beetroot slices inspired by Wonder Woman's headband. The delightful mix of ingredients in this dish not only represents the peace and harmony that Wonder Woman stands for but also how she empowers us to stay strong and healthy as she fights for justice. 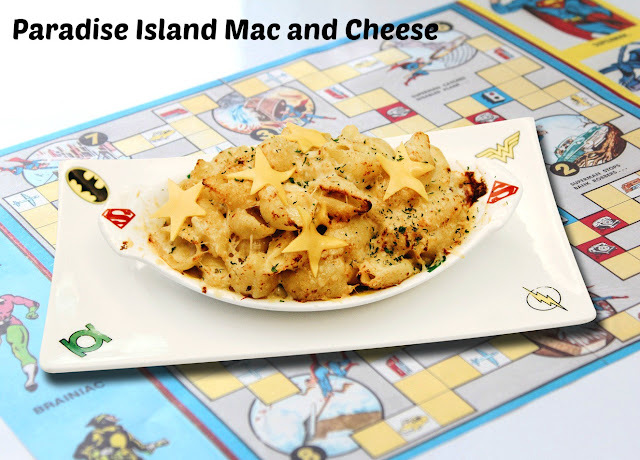 The team at DC Comics Super Heroes Cafe came up with an idea to revamp a traditional favourite Mac and Cheese dish into Paradise Island Mac & Cheese. Made with Conchiglie Rigate, identified by its shell shape that is inspired by the sea, a special Mac and Cheese sauce, Mentaiko sauce, milk and cream, chopped onions, white button mushrooms, prawns and garlic. The Mac and Cheese sauce is a delectable combination of 5 types of cheese; the mozzarella cheese, Parmesan cheese, smoked cheddar cheese, Emmental cheese and blue cheese. It is then topped with Grana Padano, a type of delicately flavoured cheese, shredded mozzaraella and more smoked cheddar cheese for a flavour-filled meal. 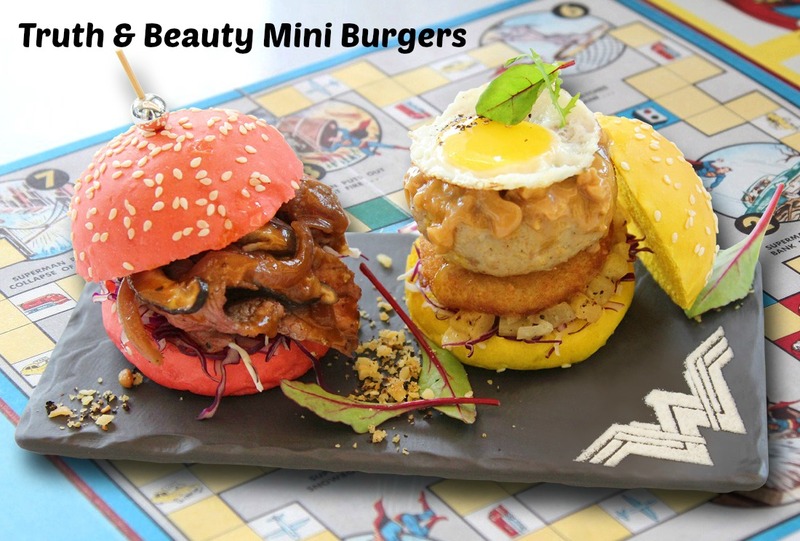 To reflect the powerful yet gentle nature of Wonder Woman, the Truth & Beauty Mini Burgers are made in the style of mini burgers to celebrate her femininity without compromising her strength and impact. The beef brger is made of ribeye steak topped with shitake mushroom, purple Spanish onion and cabbage between soft pink burger buns. The chicken burger consists of juicy pineapple salsa, peanut butter and cabbage, topped with a sunny-side up quail egg. For a sweet treat as a well-deserved reward, there is Shields of Protection Pancake. 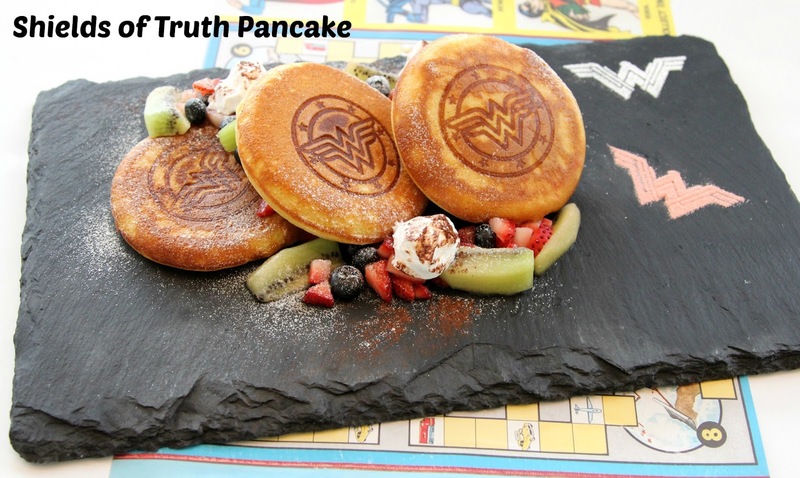 The pancakes are styled in the shape of Wonder Woman's shield, with fresh kiwi, strawberries, blueberries and mixed berries on the side. It is topped with a scoop of strawberry ice cream and whipped cream. The careful pairing of fresh ingredients with fluffy pancakes, along with the outstanding colors in this dish make it a treate for the tastebuds and the eyes. 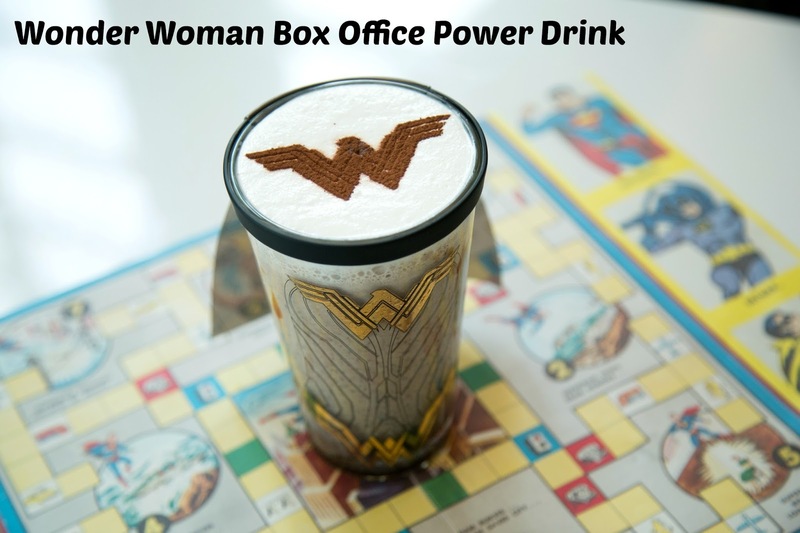 After a satisfying meal, why not sit back and relax while enjoying a cup of delicious beverage, choose between a hot serving of the Wonder Woman & Batman Latte, a splendid combination of strawberry and latter, or the cool Wonder Woman's Box Office Power, an ice-blended beverage created with all time favourite Salted Caramel Popcorn flavor. Wanna try out this limited-time dishes? Call DC Comics Super Heroes Cafe right now to reserve a table now! 1. Answer question by commenting in the blog post "Wonder Woman represent empowerment and strength, seeing yourself as Wonder Woman what do you think empower and gives you strength in your life?" 2. By doing all the required steps in the Rafflecopter widget below. 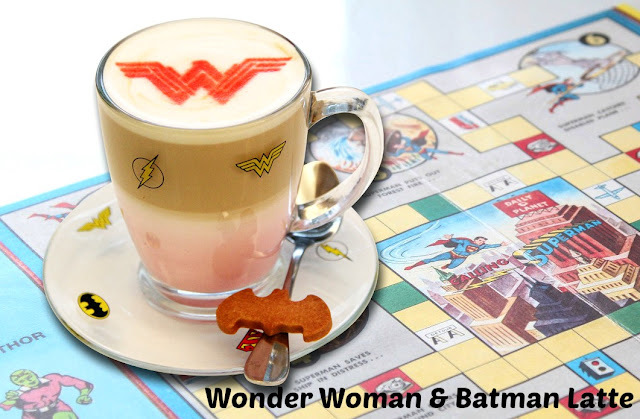 Disclaimer : We received complimentary dining at DC Comics Super Heroes Cafe to taste the Wonder Woman's menu for the purpose of this post. No other compensation were received. I watched the wonderful Wonder Woman movie with my wife and as a guy/make/man, I felt so "shiok" to see the old fogeys being put in their place by Diana when she was in London. I strongly believe that LOVE will be that powerful force and factor that empowers and gives me purpose in life. I feel that my passion in teaching empowers me like Wonder Woman and gives me strength to overcome the difficulties in life. My family and girlfriend are also those that do not give up on me and motivate me when I am feeling down. Thanks for the giveaway (: These will empower and strengthen me too! LOVE empowers & gives me strength in life! Love from family is important because blood is thicker than water. They will always be the first one to come to my mind whenever I want to share my happiness or sadness. They always support, motivate & encourage me. Love from friends are important as well because they make us feel belonged & wanted in life. With their love, my life will never be boring again! I believe love would empower me and give me the strength to live as my gf have always support me through the hard time and the love from my family supporting me always! My sons empower and gives me strength !!! Seeing my friedns and family living happily and healthily without any worries would be my greatest empowerment! Hapiness is the most important in life! Having a wonderful kid gives me renewed power and extra strength in life. Being a Mum, I discovered that I can do so much things that I consider "impossible" when I was still single. Wonder Woman really inspires me to do beyond my limit including having a super bod when she's a mother of two already! The will to live in a better world and making it a better one for my kids and the next generation. I've always felt that how we want the world to be; starts from us as we are in control and this is why as a mother, I portrait myself as their wonder woman to show them the right way, justices and grooming them to be the next upcoming Wonder Woman too. wonder woman represent empowerment and strength ! when i was a little girl i have always looked up to wonder woman, wishing one day i can be like her ! where women can be their own hero and dont need a man to save her ! wonder woman also inspired me to become a police which i am going to sign on next year! she inspired me to have justice and to always help people in need ! i know i can never be a princess from themyscira but i know i can be a successful police and hopefully inspire little girls and boys just like how wonder woman inspired me when i was young. all these dreams of mine are what empowers me to continue being a person who will fight for justice and most importantly my mother is the one who gives me strength! seeing how she would never fail to cook for me and my brother a warm and delicious meal everyday despite working long hours in the morning and being a single mother and raising me and my brother is not easy. she gives me unlimited strength, she is my wonder woman.so i would like to win this and bring her out for a nice meal ! Definitely my kids..they gave me strength i never had! The everlasting love and support from my family empower and gives me strength in life! Because I know that I will always have a shelter when I am down or when I am faced with huge obstacles, I am not afraid to try new things and work hard towards my goal or dream. Also, being the eldest sister in the family, I feel that the family would need me, for instance my sister needs me as a role model, my mum needs me to help her share her burden. Therefore, I would always think back about all these when I fall down, but pick myself up soon after because I know that my family needs me and they are supportive of me, therefore, they empower and give me great strength to overcome all challenges in my life! Wonder Woman really inspires me. No matter how tough, do not give up. Always believe in yourself. My children are the one who give me strength. They are sensible and they always love me. This great love from my children is the strength to me, that guides me to a better person. I sometimes feel tired, but when my children give me cup of milk, or a little hand massage, I feel better already. I WILL DO BETTER, AND I KNOW I CAN DO IT. Ever since my first child is born , followed by second child almost 4 years apart , they empowered my life , gave me lots of strengths which I never knew I had . I'm most willing to do , to sacrifice everything , just for them ! The power of love in the family will empower me and always keep me moving forward even if there is huge obstacle infront of you. Family will always stay with your throughout. They are your pillars of support. My remarkable mum empowers me, single mum raised up me & 2 sister's by taking up few jobs to support us a seamstress at home, working zi cha stall washing dishes and hand washing clothing & cooking at neighbours house. She suffered alot when for us. She had both knees replacements many years back. Due a crooked kness she had to go second knees operation in 2 weeks time. She is a wonder women & we going through with her. Hope everything is going smoothly. One of the biggest teachers of this empowerment has been my active lifestyle and fitness. That’s why it is so important for all women to live an active lifestyle. Love from family members empower and gives me strength in my life. The power of love! My mum empowers me with strength in life with her unconditional love and care. She single-handedly raised the 5 of us by doing two jobs, do housework till past midnight and teach us good morales. I know it been tough on her to act dual roles as a mother and a father but she never complains. Because she just want to give us the best she could and seeing us grow up healthy and happily is her only wish. Now we are mostly married, have stable job and children. Without her, we wouldnt be who we are today! She is also my best friend who listen to my problem, share my worries and happiness. Grateful for her everything! Sincerely hope to be chosen to bring my WonderWoman aka mum to enjoy this good feast. Thank you for the chance. Love empowers me and my dearest family and kids give me the strength and support to over come any challenges. My passion for life and learning gives me power and strength. I did not realise that I will have such empowerment and strength till I become a mother by myself. Unconditonal love, care and support giving to her is natural reaction as a mother. I'm able to be a multitasking, be a listener, teacher, nurse, life saver, her best friend and etc from time to time when she in needs. I will continue to be strong and never give up!!! My family gives me empowerment and strength!